This is a beautiful Florida bonneted bat, one of the rarest bats in America. Photo by Enwebb. Hi everyone! Happy spring! I hope you all had a good week! I have some amazing news! 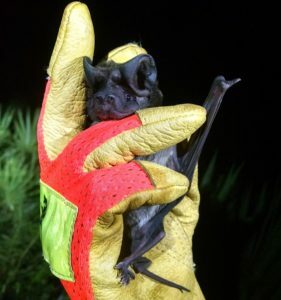 There is a horticulturist in Florida who has created a bat house to help one of the world’s most endangered mammals. The house has been designed to help the Florida bonneted bat. This bat has sadly lost most of its habitat and only a few hundred are left. The new house is able to hold more bats that the ones most people have in their homes. Even though this house seems perfect for the Florida bonneted bat, there is a chance that it won’t attract bats to live there. While it’s sad to see an empty home, it will still help the bats. When they see a giant bat house, people passing by are drawn to it and become interested in what they can to do to help bats. The house was inspired by three houses used by a half-million bats at the University of Florida. It has two stories and a big roof for the bats to hide and rest in. Some bats such as the common Evening bat and the Brazilian Free-tailed bat like to roost in tightly packed spaces, so they might enjoy the lower level of the house that is a bit smaller than the top. The Bonneted bats are more solitary animals who will hopefully like the larger upper level of the house. If you would like to read more about this new house, you can read about it here.